Seoul is currently one of the most liveliest and dynamic cities in Asia that is emerging as top visiting destination for tourists. Embracing both old and new, Seoul is a representation of a unique culture in Korea that tries to preserve the tradition and constantly develop with the latest technology and modern trends. Life in Seoul is built to be easy, convenient and quick, and has a lot of offer in variety of aspects from attractions, food, nature, nightlife, shopping and more. You will be pleasantly surprised at how efficient, fast-paced everything is here in Seoul. Some may say it’s silly to own a car in Korea when the country, especially Seoul, operates one of the best public transport system in Seoul in the world that is fast, convenient and cheap. All subway lines are color-coded with english translations as well as voice announcements recorded in multiple languages to assist the foreign travelers and residents on the ride. The Cyber Subway Guide, provided as a mobile app, is a high-tech subway guide that will provide all information on transfer, fare, and even the quickest route. 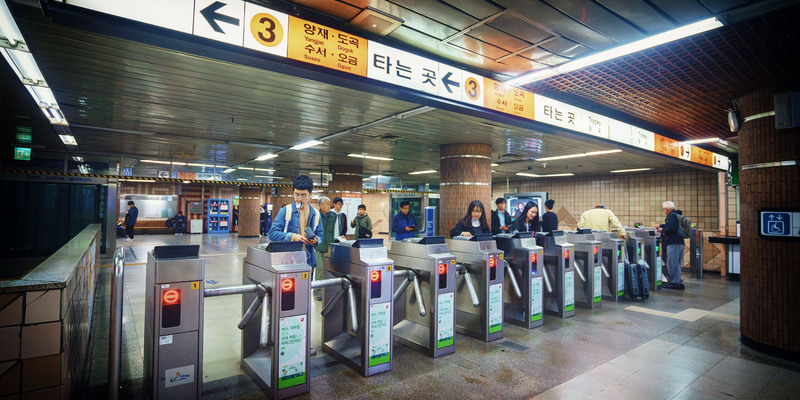 Subway is a safe choice for those unfamiliar with Korean, but as long as you know your exact destination, taking buses is a great option as well! Besides the subway and buses that run during the regular hours, there are late night buses in Seoul that cover high traffic areas around popular tourist areas. If you are a night owl and feel a bit adventurous at night, try these night buses and take an advantage of these affordable transportation! ( Search Seoul Transport Operation & Information Service for more information ). Late for plans and in hurry to get somewhere fast? Taxis in Korea are clean, inexpensive, and plentiful so hop on the taxis that have the indicator lamps on on the roof, which signals its vacancy and availability. In case the taxi drivers may not be fluent in English, it is a good idea to research some landmarks near the destination such as hotels and attractions and give the taxi drivers an idea where you are going. The climate of Korea is generally characterized by four seasons with spring, summer, fall and winter, and you will be able to observe beautiful sceneries of various sites in different seasons. Cherry blossom festivals, fireworks, and maple leaves are some of the highlights of our seasonal sightseeing. Make sure to pack attires and shoes appropriate to the weather since a hot, humid summer and cold, windy winter is something you’ll have to prepare for. The unit of currency in Korea is Won ( W ), and most currencies are easily exchangeable at either banks and hotels. Notes come in W1,000, W5,000, and W10,000, and the coins come in W10, W50, W100, and W500. For your own convenience, we suggest you to change money prior to departure or at the airport on arrival. Known for its low crime rates, Seoul is crowded city that never sleeps so you will most likely find someone walking alongside at almost any time wherever you go. Most Seoul apartments and buildings require gate, front door key as well as an individual door key. And some buildings are even equipped with high technology and requires digital combination for an entry. South Korea may have an ethnically homogeneous country for a long time, but many Seoulites are now used to seeing foreigners and understand basic english. Same applies to many shops, restaurants and public facilities in popular area. Many staffs working there speak fluent english and will provide a super friendly service culture that Korea is known for. You will be able to enjoy a pleasant experience even if you need a little help with translations. Also, the digital culture is amazing here in Korea and you will love that you are almost always connected with free wifi. From busses, subways, and trains all carry public wifi, and most cafes provide wifi as well. Seoul is one of the biggest night capitals of the world, and accommodates all sorts of activities during the day and night thanks to its 24 hour open facilities and entertainment. Sip your favorite coffee and work at a 24 hour cafe if you have a laptop and a deadline to meet, check out a late night “Pojangmacha” ( a small tented wagon that sells various street food ) or order in fried chicken at 1 in the morning, sing your heart out with your friends at “Noraebang” ( a singing venue in private sound-proof rooms ), or play some games at “PC-Bang” ( internet cafes ). What foreigners may find most culturally fascinating is probably the “Jjimjilbang” experience. “Jjimjilbang” is a Korean sauna with whirlpool baths, mineral rooms, massage parlors, tv rooms, restaurants and more that aims to revitalize and rejuvenate the customers. When talking about Seoul or Korea in general, it is impossible not to mention Korean food. Once a primarily agricultural nation, Koreans have cultivated various food and food has been a huge part of Korean culture since the old days. Today, Korean cuisine vary from wide spectrum of meat, fish, vegetables, soup, noodles and of course, rice dishes, staple food of Korea. Korean food is generally a very well-balanced diet and our go-to side dish “Kimchi” ( a fermented spicy cabbage ) is also high in nutrition and known for its distinct taste. Besides the restaurants, food shops, and street carts, you will also have the option of ordering a delivery on almost any menu. From fast food to full meals, variety of delivery service is available and even goes to places without addresses. Thanks to Korea’s massive globalization due to the rise of K-pop and tourism, Seoul consists of districts and neighborhoods with various atmospheres and iconic landmarks that each appeal to different crowds. Here are some of the suggested sites out of many: “Gwanghwamun Square”, “Kwangjang Market”, “Itaewon” and “Hongdae”. If you are interested to learn about Korean culture and its roots, visiting “Gwanghwamun Square” and observing historically significant exhibitions is a must! From statues, fountains, ancient palaces, and attractions, many symbols of Korean history and heroes are displayed throughout the area. The most notable one would be the “Gyeongbukgung Palace” founded in 1395, which is now a home to the Government’s major administrative departments. Feeling hungry after a vigorous history tour? Go for an another classic Korean culture experience by eating at the “Kwangjang Market”! 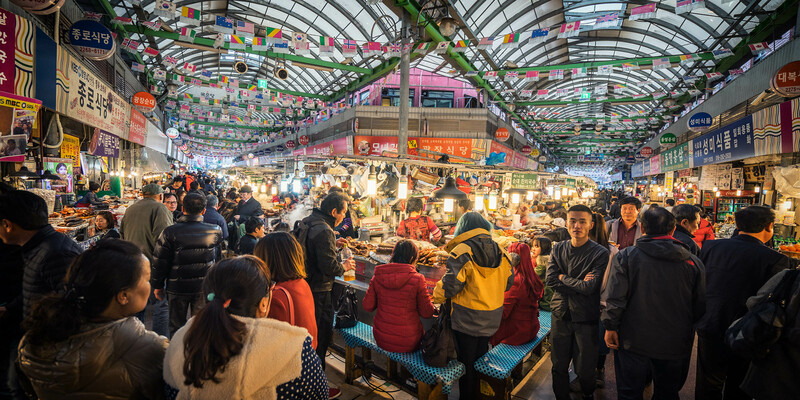 At this market, you will get to witness Korea’s street food culture in its liveliest form. From “tteokbokki” ( a Korean soft rice cake with spicy sauce ), “gimbap” ( rolled rice dish with other ingredients served in bite-size slices ) to “bindaetteok” ( mung bean pancake fried in oil ), most dishes here are sold at an affordable prices and big enough to share with friends. 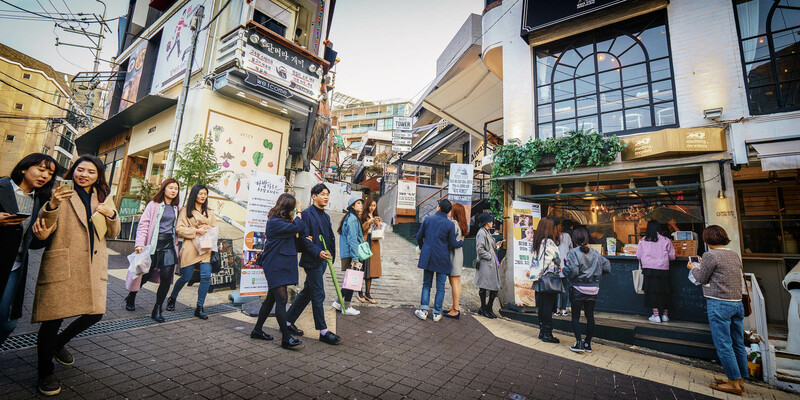 If you’re feeling a bit homesick or culturally diverse, drop by “Itaewon” which is one of Korea’s top international hubs that consists of variety of shops, entertainment venues, restaurants and cafes. 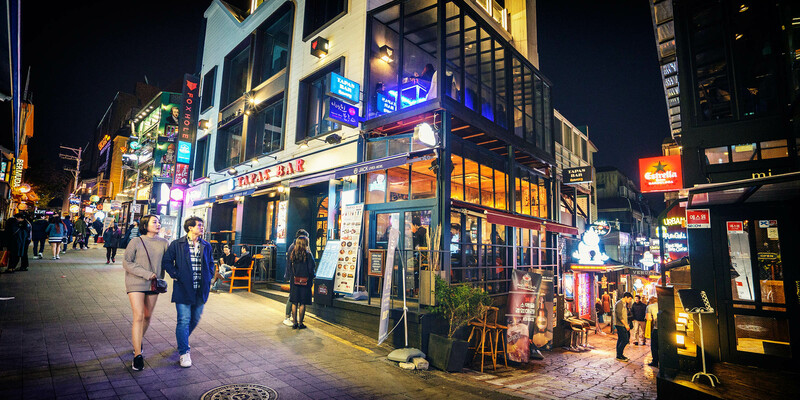 Famous for its ethnic diversity, Itaewon is a foreigner-friendly, multi-cultural zone as well as authentic cuisines and cultures from all around the world thanks to 40 or more restaurants and fashion shops owned by foreigners. Dubbed as one of the most hip and youth-driven place in Korea, “Hongdae” is a musically and culturally relevant site that many visitors go to. The mecca of virtually all underground music in Korea, Hongdae carries famous music bars and clubs in every corner as well as busking performances on the street with aspiring and professional artists ranging from music, dance, magic to other forms of entertainment. With bars, coffee shops and bakeries, modern restaurants to art spaces, Hongdae has been a popular for place for many residents and visitors as well.